The Korean Rehabilitation Centre for Children with Disabilities (KRCCD) was established in March 2012 following the KFPD’s unrelenting efforts to raise awareness of disability and positive effects of early intervention for children with disabilities. 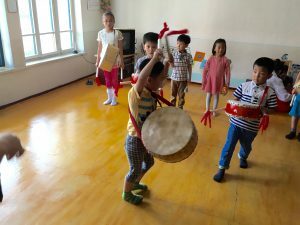 The Centre was designed to not only offer early detection of disabilities but also offer a model of inclusive education in the DPRK, which is still a very new approach to disability in the country. It gave children with disabilities a place where they would be supported through physical rehabilitation programmes and have opportunities to learn, play and participate in society with many progressive opportunities such as specialised education, extra-curricular activities and projects that support their integration into a society that is beginning to understand and accept them.